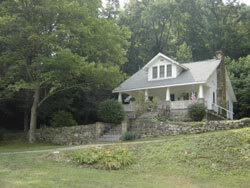 The history of the Clementine Cove began as early as the appearance of the Cherokee Indians in Western North Carolina. When Moses and Patience Proctor came across the mountains from Cades Cove, Tennessee into the Hazel Creek area in the late 1820’s they found that only one Indian family lived there. This beautiful country has captured the hearts of many people but only the most “hearty” in spirit would be willing to forge out a living in these rugged mountains. During the 1700 and 1800’s many families from Scotland, Ireland, and Germany would find that these mountains reminded them of their original homeland and so they decided to make their new homes here. Many towns and communities began to flourish in the valleys and along the rivers and creeks with their rich bottom lands. By the late 1800’s and early 1900’s the towns of Bushnell, Judson, Proctor, Sugar Fork and Ja’pan (pronounced with a long “a”) had become the hubs of mountain life where these hard-working folks could engage in business and fulfill their needs for every day life. The town of Proctor, which was named for Moses Proctor and was located along side Hazel Creek, would become a thriving town of over 2000 residents with schools, churches, businesses and a 300 seat theater. Conveniences such as telephones, street lights, and a rail system enabled the residents to lead a “modern” life. Farming, logging and mining were huge sources of productivity. In the late 1800’s, the Bradshaw family had chosen the Wolf Creek area of Graham County as their “home place”. This area would become the community of Ja’pan named for the Japan Clover that grew there. Thomas Bradshaw, who was born in Haywood County, had moved to the area, met and married Patience Maranda Proctor, the granddaughter of Moses and Patience Rustin Proctor. Thomas was a farmer and they would make their living while raising their family in the community of Ja’pan. Thomas & Maranda had four daughters Cassie, Marinda (Rindy), Carra (Carie) and Candice Elmina (Miney) and two sons, Edmond (Ed) and Andrew (Andy). In 1899, Elmina, the oldest daughter, gave birth to her first son and named him Oliver Fred. Fred took his mothers maiden name of Bradshaw since he was born out of wedlock. Fred lived with his Grandfather, his mother, his two Aunts, Rindy and Carie and his Uncle Ed Bradshaw, and life on his grandfathers farm located alongside Wolf Creek would become the foundation for the life of this industrious, young man. Fred married Martha Marcus February 12, 1921 and they too began their life together in this, now thriving, community. Martha said that Fred came for her with a little mule to ride the day they got married. They began a long, happy life together but their lives would be marked by events that would try their strong faith and threaten to uproot their close ties to their beloved mountains, its people and the strong connection to their pioneering culture so deeply tied to the earth. Soon, Fred and Martha would learn to rely upon their faith, their community and each other in a way that demonstrates the integrity of the "mountain way". Fred's mother, Candice Elmina, died that year in September. She had married Charles (Charlie) DeHart and had two other sons, Martin Van Buren and Richmond Auten. These brothers were not only brothers to Fred but also dear friends. They would continue to be close all through life and would help each other along the way. Martha's mother had died when she was a young girl of thirteen but she too kept close ties to extended family and often looked to them for support as a young wife and mother. Martha was the youngest of several brothers and sisters. Her father, George Dallas Estes Marcus, first married Caroline, who died young, leaving four children. Those children were Harve Marcus, John Marcus, Tiny Marcus Crisp and Frances Iowa Marcus Proctor. Dallas later married Sarah Jane Maynor. Dallas and Sarah's children were Rufus Marcus, Ellis Marcus, Zena Marcus Crisp, Effie Marcus Bebber, Oma Marcus Jenkins, Mary Marcus Sawyer and of course, Martha. Fred and Martha’s first home was at Ammons Branch near Almond where Fred's natural father, Will Ammons, lived. From there, they moved to Smokemont where Fred worked at the Band Mill (a saw mill where logs were processed into lumber). Martha enjoyed living there. They lived in a “company house” surrounded by family and friends who also worked there. She enjoyed a time when she didn't have the responsibilities of caring for her elderly Father. Martha’s mother had died when she was only thirteen years old, and although she was young, she had remained at home to care for him until she married. 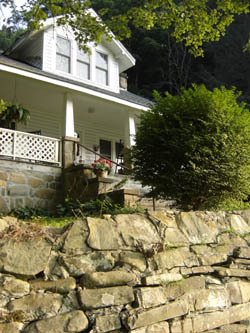 She and Fred moved to the Nantahala Gorge from Smokemont where they lived for a short time. While Fred was away working, a cloud burst occurred and washed their house away including most of their furniture. At that time they decided to move back to Ja'pan. Martha told the story of when they moved across the mountain from the "Gorge". Buren, Fred’s brother, helped with the move. They walked across the mountains twice in the same day to salvage what was left of their belongings to set up house keeping again on Tobacco Branch in the community of Ja'pan. This must have taken a great effort since there was only a footpath across the mountains through the gap between Tyre Knob and the "Jump Up" which is now a part of the Appalachian Trail. The house that they moved to had no windows, only shutters, and the day was cold and snowy, but they were happy to be back in Ja'pan. Fred’s Grandfather, Thomas, died in 1926 leaving his children his house and land. Rindy and Carie, who were unwed, stayed on at the old home place while Cassie and her family moved to New Mexico. Andy moved to Central North Carolina and continued to live there until he died. Rindy and Carie were happy to have Fred and Martha back home with them. These two women had a great influence in the lives of Fred and Martha and they continued to give them support as they worked hard on the farm raising all their own food by plowing and working the fields to supply their growing family with all their needs. Fred also logged and did carpentry, masonry work (known in the mountains as “rock laying”) and many various jobs while raising their family. The couple had managed to come through the depression by learning to use their “mountain ingenuity” and to utilize everything available to them to survive. It was common for them to sew all their own clothes, mend their own shoes and carry about the daily chores of life without much of what we think of as modern conveniences such as inside running water or electricity. While their family and friends at Proctor and Judson were enjoying these luxuries Fred and Martha were just getting themselves started in Ja’pan. Many other wonderful family members and friends helped them also, and as mountain tradition has always been, they also helped and supported their family and friends. Rindy and Carie both died in 1937 within one week of each other from a condition called “milk sickness”. Their cows had ventured high up into the Clementine Cove and had eaten poisonous plants called White Snakeroot which is transmitted to humans through drinking the milk. This was a great loss for Fred since they were like mothers to him. 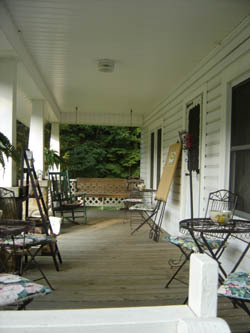 Upon their deaths, the home place was left to Fred and Martha, Buren & his wife Mamie and Richmond and his wife Gracie. 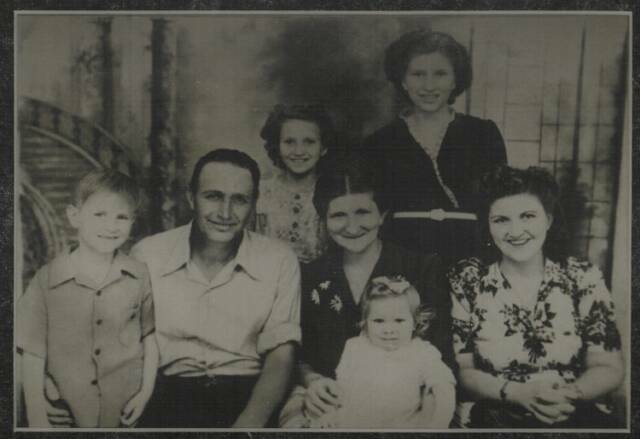 By the early 1940’s they had built their life around the land while raising their six children. They had begun to acquire some additional land by “pinching and saving” every penny to put toward this effort. Eldred, their oldest daughter, recalled a time when her father, Fred, would wrap rags around his feet, because his shoes were so worn out, to go “logging” so that he could make the payment on the land. On another occasion he sold the cow, made the payment, and then bought it back only to sell it again to make another payment. Being born out of wedlock, and not having his own father around, Fred had a great desire to keep his family close. Also, having a high sense of responsibility, he wanted to give his children a good start by giving them a piece of their own land when they married. Fred and Martha’s children were Eldred Phyllis, James Chester, Frances Nola, Wilma Pauline, Charles Fred and Glenda Ann. Life for this family would soon change dramatically as it would for many people all over the world. In December of 1941 World War II was brewing and the nation became involved when the Japanese attacked Pearl Harbor. This was a time of great patriotism everywhere and it was no different here in the mountains. After all, these folks were accustomed to “pitching in” and the idea of serving your country was quite natural. Food and gas rationing was soon implemented, and many local boys enlisted or was drafted. Some families displayed several military stars in their windows indicating the number of sons at war. These mountain folk could not have imagined how the world would change and the part they would play in that change, Fred and Martha were among them. Early in 1942, the family received the news that their country would ask for a tremendous sacrifice for the war effort. The TVA (Tennessee Valley Authority) was gifted land from Alcoa Aluminum who had plans to build a dam at Welch Cove (Fontana) to produce power for the production of aluminum. Power was also needed to supply the Tennessee Valley with electricity and a system of dams down river would ensure flood control there as well. When Pearl Harbor was attacked on December 7, 1941, the TVA and the US government joined forces to begin construction of what would become the highest Dam east of the Rockies. In January, 1942, only weeks after Pearl Harbor was attacked, bulldozers would begin pushing dirt followed by workers to begin construction of the enormous Fontana Dam to support the war effort. This huge dam would reach a height of 480 feet and would dam rivers and streams spanning 30 miles behind it. Five thousand workers worked twenty four hours a day, seven days a week. This was an essential war project and thousands of residents were informed that this effort would require that all the land, along with the towns of Proctor, Judson, Bushnell, Sugar Fork and Ja’pan and the surrounding communities would need to be confiscated and demolished so that the basin could be filled. While these families knew that this was a tremendous sacrifice they really had no choice but to do what was asked of them. Fred and Martha now realized that once again they would need to begin making plans to re-build their lives. Chester (Chet) was inducted into the Army on March 29, 1943 where he served in Magnolia Italy. Many other local families were also giving their sons for service. This was a proud but sad moment for Fred and Martha. They had already seen many difficult times but this was the hardest. This was their first son and Fred relied upon Chet to help with the farming and logging work. The Tennessee Valley Authority (TVA) gave most families about $37.00 per acre for their land. Many disassembled their existing homes and carried them with them to rebuild elsewhere. 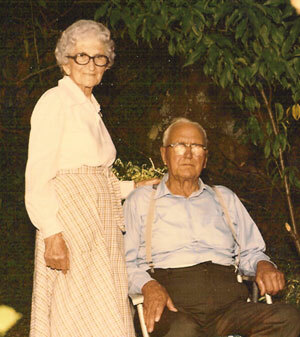 Fred and Martha bought the old Panther Creek church building, which would soon be covered by the water, tore it down, and built the house that now sits in the “Clementine Cove”, high above the flood line. Again, they used their ingenuity to survive. Of course, these mountain people did not fully realize at that time that this event in their lives would also set into motion an even greater world changing event. As we now know, their sacrifice made possible the accelerated production of the nuclear material necessary for the completion of the atomic bomb, "Little Boy", that was dropped over Hiroshima. Uranium production was very slow, but the power produced at Fontana enabeled a much faster process. The war could have lasted for years with many more lives lost. While the use of the atomic bombs was tragic, many lives were saved and in the end, the success of World War II must, in part, be credited to the people of Western North Carolina for their contribution. The sacrifice of these people was the root of the success of the Manhattan Project and thus, the success of World War II. These families were to speak little of this part of their past since they realized that many others had sacrificed even more. Using their skills and strength of character each family used what they could to make a new life for themselves. Fred and Martha began their new way of life by buying the old general store of Ja’pan from Grady & Lona Andrews Mashburn, who left the area to move to Haywood County. Fred pulled the old store up from Panther Creek with mules to sit near their new home in the Clementine Cove. He also built cabins and small boats with handmade paddles for rent. This would enable them to begin their life again with the introduction of the new Fontana Lake. After the war, Chet arrived home from the Army to find that he didn’t even know where "home" was. He came by taxi from Bryson City and passed the new "home place" before realizing where he was. Other mountain sons returned home to realize that great changes had occurred, not only to themselves, but to their mountain way of life. Glad to be alive, life went on. On March 29, 1947, exactly four years after he had been inducted into the Army, Chet married Blanche Rose who was only thirteen years old when he left. Jim Paige, a medic and prisoner of war, met and married Eldred. Frances married Elmo Andrews from Ja’pan. Elmo had served in the Philippines where his ship was hit by a kamikaze plane and is noted to have driven the first American vehicle onto the Japanese mainland after the bombs were dropped. Wilma, Charles and Glenda lived many years more at the new home place before marrying and moving away. Wilma married Pleze Sawyer, Charles married Patricia Owens and Glenda married Ray Whitaker. There have been many happy days spent at the Clementine Cove by the children and grandchildren of Fred and Martha and by many, many other family members and friends over the years. Their door was always open and there was always food to eat day or night. Of course, the most treasured gift from Fred and Martha has been the many wonderful stories and advice for living passed along to us all. When “the cousins” had a problem and something seemed impossible to overcome they would hear Grandpa Fred say, “well sassifras young’ins, there is always another way!” Many times in their own lives they now apply this practical piece of advice. 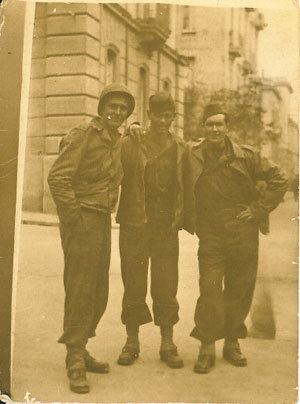 This is a photo of Chet in Magnolia, Italy with his buddies. He is on the left. This picture was taken at the last family reunion in 1980 at the Cove, shortly before Fred died.